English Typing and English Shorthand Knowledge they can apply online. Official website to online application is www.delhihighcourt.nic.in. Last date to apply online for this DHC PA jobs recruitment is 24-11-2018. Candidates selection for this Delhi HC Personal Assistant recruitment will be based on Written Exam Objective type, English Type writing, English Type Writing, English Shorthand and Written Exam Descriptive type. 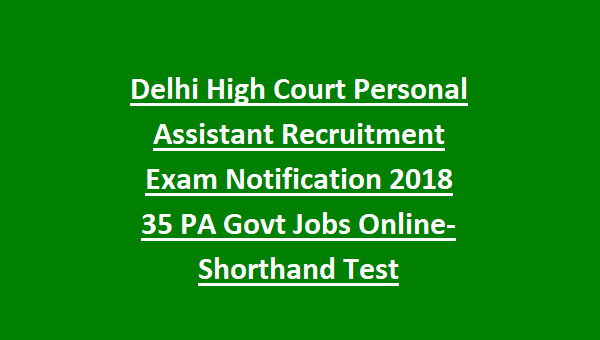 Exam Pattern in detail, exam syllabus, age limits, online application process and other details of this Delhi High Court Personal Assistant PA jobs recruitment notification 2018 is given below. 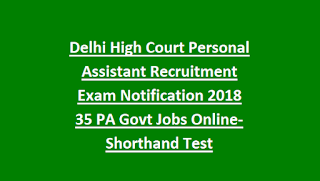 There are total 25 Senior Personal Assistant Jobs in this Delhi High Court recruitment 2018. As on 01-01-2018 candidates age limits are 18-27 years and for SC/ST 5 years, for OBC candidates 3 years and Ex Serviceman Gen-3 years, ESM BC-06 years and ESM SC-08 years of age relaxation is given. Candidates must have qualified Degree and Stenography Test in English for applying this PA jobs of Delhi High Court recruitment. Must have 3 years of relevant work experience for Senior PA jobs. For DHS PA jobs application fee is Rs.300 for general candidates and for all other categories application fee is Rs.150/-. Stage 1-Written Exam will consists of 120 questions. 1/4 negative marking will be deducted for each wrong answer. 40 Words per minutes typing test will be conducted on computer. Test duration is 10 Minutes. 100 words per minute. 5 Minutes dictation will be given in English candidates have to type that dictation on computer in 45 minutes. Those who quailed all the all the 3 stages they are only eligible for descriptive test of Delhi High Court Personal Assistant jobs. The written examination will be of two hours duration consisting of Essay, Translation, Comprehension and Letter writing of 25 marks each. Candidates who interested in these PA jobs of Delhi High Court they can apply online before the closing date of 24-11-2018. Official website to apply online is www.delhihighcourt.nic.in. Exam Admit Card, Exam Date, Exam Syllabus and pattern and other details are available in this website only.